We are all familiar with wagon trains - the overland trips of trials and tales of our ancestors. But not all of our ancestors traveled by wagon trains to California. Many traveled by ship; over 15,000 people in 1879. Perhaps one of your ancestors took this route to the west coast. Like researching Wagon Trains 1840-1860 our westward bound ancestors who traveled by sea, diligently wrote diaries and letters. 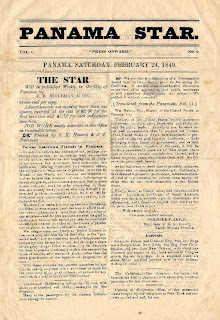 Panama and west coast newspapers reported arrivals of passengers and hotel visitors. There are many other avenues to tracing the steps of your ancestor. The Panama Canal did not accommodate ocean vessels until 14 Aug 1914. 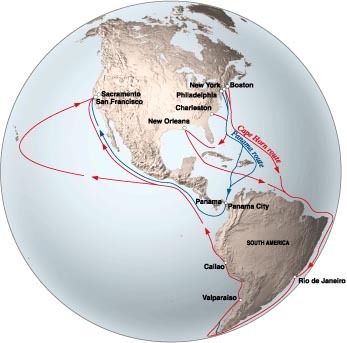 Before the canal gold-seekers and travelers from the east coast had 3 routes to get to California from New York: 1) a trip from 70 days to 5 months around Cape Horn 2) to Panama and crossing the isthmus by land 3) overland. The voyage by sea was not necessarily easier than overland, but a preferred option between 1848- 1873 for those who traveled light. It was also favored since a shorter voyage than rounding the Horn. This route was not reserved for East-coast travelers. Many from the Midwest would take passage down the Missouri River to the Mississippi to New Orleans. From there they would catch a ship going to California. Like the challenges of the wagon trains, the migration to California through Panama did not lack challenges of its own when crossing the Isthmus. This was an expensive route and the passengers had to travel light, leaving their belongings behind. Passengers had to get off the steam boats at the mouth of the Chagres River, 75 miles away from the closest town, and pay passage to locals to be chartered in smaller canoes (cayucas or bungos) to the town of Chagres or Las Cruces. From there, travelers hired mules or walked the 25 miles to to Panama City for a ship on the West coast of Panama heading north. By 1851 the Panama Railroad was used by the gold-seekers, shortening the crossing the Isthmus. This route was not for those who wanted to carry many belongings. The transport from Panama to California may have required a stay in Panama for several weeks (or months). 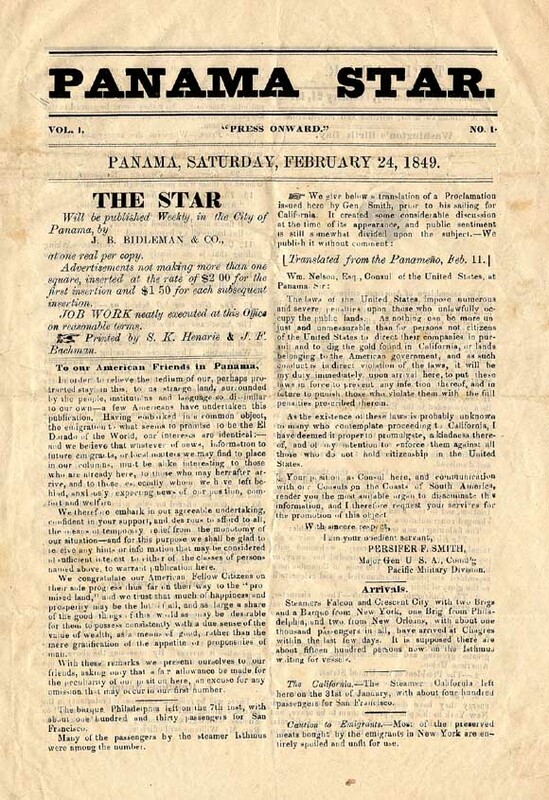 Many of our ancestors succumbed to the cholera epidemic in Panama City, others were victims of yellow fever, malaria, or dysentery, while waiting.Travelers around the Horn also suffered from disease and epidemics. Louis J. Rasmussen's "San Francisco Passenger Lists," Vols. 1, 2, and 4, and "California Wagon Train Lists," Vol. 1. Peter E. Carr's "San Francisco Passenger Departures," Volumes 3 and 4 from San Francisco to Central America, July 15, 1851, through June 16, 1852. California State University Library, Stanislaus. The Diaries, Journals, Letters of Overland, Isthmus, Cape Horn and California. I have several generations of Lenoras in my family. These Lenoras always said they were named after the covered wagon our ancestor took to the Gold Rush in 1849. All the Leonores passed away some time before I found out that "the" Leonore was actually a ship to San Francisco out of Boston by the New England Mining and Trading Company! I was able to find quite a bit of information about the expedition, the miners and the Gold Rush after I stopped looking for a wagon! Its amazing how myths can side track our research, but also how they always seem to have a grain of truth! The ship was much faster to California, and his return was via the Ithmus of Panama because by then the railroad was completed. Thanks so much for stopping by. Every time I mention this to a client, they just stare with a frown and usually state "But the Canal wasn't open yet!" You have validated my point that people really did go by sea. And there are ship manifest to prove it. And most return trips after the railroad was via the Ithmus of Panama. Have you found records? Thanks for stopping by and commenting. where dia you find your ancestor's return passage information? I'm getting questions from my readers, and want to make sure I'm covering all the bases. Exactly, Sheri! George Emerson (my 3x great grandfather) was in the Alta California on 1 April 1850 in a passenger list for Panama. This means he was only in California a few months. The lure of gold has fascinated mankind since antiquity. Many voyages to the New World and elsewhere, by Spanish, British, and other explorers, were in quest of gold.